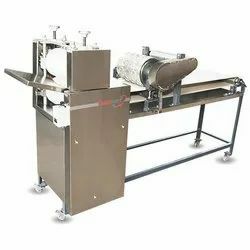 Pioneers in the industry, we offer automatic roti making machine, compact automatic chapati making machine, 12 inch automatic chapati making machine, automatic chapati making machine, semi automatic chapati making machine and commercial chapati making machine from India. 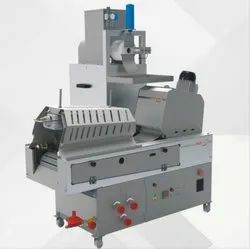 The automatic chapati making machine boasts of being the world’s smallest automatic chapati making machine with a capacity to cook 400 chapatis in one hour. One of the most innovative products, the machine was designed, developed and perfected over a period of two years. 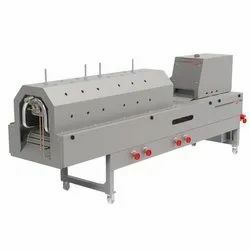 Known for great ergonomics and compact size, the machine is used by leading caterers and restaurants to cook chapati, even at outdoor catering locations. 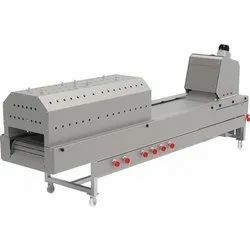 With great mobility, compact size and low gas and electricity requirements, the machine serves as an ideal chapati making solution for the F&B industry. 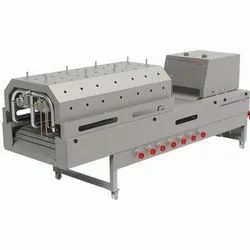 The machine uses single conveyor and 360-degree chapati baking technology, advanced precision motor, and gearbox that promises a high rate of production with optimum chapati cooking or roasting and least maintenance. Also, the machine offers better insulation owing to superior-grade heating components. Size of Chapati 3" to 12"
Chapati Production Rate 1200 Pcs. / Hr. Chapati Weight 25 to 45 Gms. Electricity Consumption 2.5 kW / Hr. LPG Consumption 3-4 Kg / Hr. We are dealing in Commercial Chapati making Machine.